It's been a while since we've seen Mike (who lives in Calgary) and I've got a car and vacation time, so a road trip is a natural fit. Jeremy and Karen also have some time off so away we go - our trip around BC. 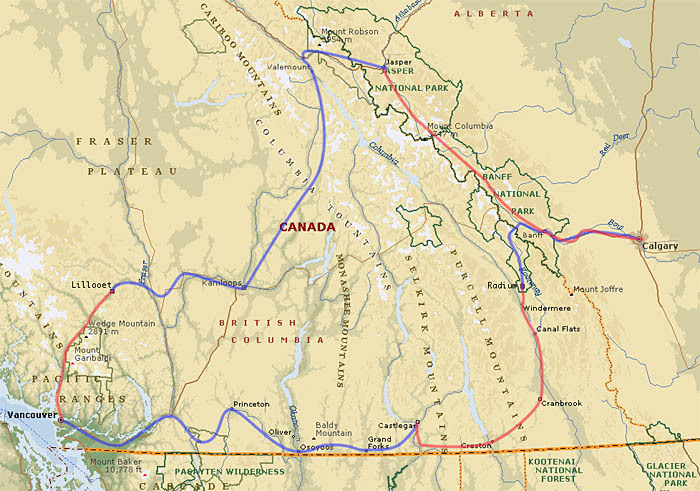 There are at least three ways to get to Calgary from Vancouver - the direct route is the #1 (Trans Canada), but you can also take the #3 (Crows nest) in the south of the province, or the number 5 and 99, north of the #1. We decided to avoid the high speed #1, and take the slower routes for our trip. After passing through Manning park, it was all new to me - Salt Lakes, Produce stands, and a handful of small towns I've only ever heard of. Such a nice park! We finally crossed into Alberta and stopped in Banff for Lunch to celebrate. Ah, a day of rest! Lunch in Lake Louise, now try to find a good place to stay in Jasper! Karen needed to be in Kamloops by mid afternoon so it was a long day of driving (we crossed most of the province). Karen has set up a web page with photos from her perspective. Nice! Though you spelled Keremeos incorrectly. You spelled it "Keremoes". WRONG. It should be spelled "Keremeos." It would be nice if you corrected this error.